WAIT TILL WE HIT THE DANCE FLOOR! I'll start: "So, tell me, Doc, do you see any love in there?" Such a fun answer Laney. Well, I love all of those captions, but I especially love,"Our love is magnified." But, it's really hard to choose a fave. Nice job, Mary! Congrats! That's the prefect answer! *that's supposed to be "perfect," darn phone. Lol. 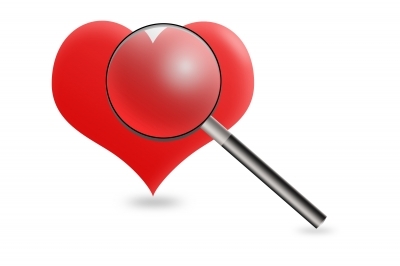 I love, "Examining our love." Great caption, Britney! My love for you keeps growing. I know love is blind but that's ridiculous. The blind caption gave me a good giggle. But my fave is, "Can you see how much I love you?" So perfect, Rita!! I probably shouldn't enter this again, but I just can't resist adding my own captions. Well, I'm glad you joined us again, Laney, and I hope you'll join us every week. Wow, those are a whole lotta great captions. I can tell you are good at this! So hard to choose a fave, but I think it would have to be, "Looking for love in all the right places." Very clever!! I know it is cheesy, lol, but I do love Sherlock and the magnifying glass just sealed the deal. Haha. Hey, you know I love cheesy, so you've come to the right place! Such a creative caption, Christy. I love it! That makes me want to sing the song, Feels like home to me, and replace it with Looks like love to me. Now I can't get the song out of my head. Love that caption, Laura! I spy with my little eye... Love! I really, really love, "Love is not hard to find." Such a fantastic caption, Jana! Hope you and baby are doing great! Sorry I missed last week; super busy! Hope that everyone had a good Christmas/Hanukkah/Kwanzaa and a happy new year! I can't believe it's past halfway through January! Boys and girls, this is a before picture of the Grinch's heart. Whose idea was it to bring magnifying glasses to Biology class on Dissection Day? No problem, Natalie! Although I always miss you when you're not here for WW. Love your captions, Natalie. Every single one of them brought a smile to my face. Great job. Your creativity amazes me.